It is falsely claimed by some that Anarchism, as currently constituted, is unable to attract Black people, and other specially oppressed minorities. It is therefore argued that we should thus endorse separate Black-only anarchist/community organisations that may in some (vague and unspecified) cases associate with “white” groups – “white” groups should “work among” “their own” people etc. )… but… “it was the ability of anarchism to provide alternatives and to pay special attention to the specific needs of … different sections of the working class in order to unite the whole class that made the success (of the Cuban anarchists and IWW) possible,” not “a revision of anarchism to accommodate nationalism”..
We recently observed a very fruitful discussion on race and class on the internet, particularly around “black” anarchism, special oppressions and the desirability of separate organisation. 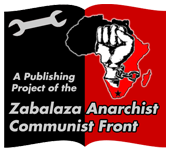 One of the best and most comprehensive posts came from a member of the Workers Solidarity Federation of South Africa, an anarchist/syndicalist group which while in a personal capacity reflects their politics and positions on these matters. Interest in anarchism is growing throughout the world. There are active groups in most parts of the world, with the exception of the Indian subcontinent, Antarctica and as far as we know the Chinese dictatorship. This process will no doubt accelerate and there is a challenge for us to make our ideas accessible. But as our South African comrades point out below, “it was the ability of anarchism to provide alternatives and to pay special attention to the specific needs of these different sections of the working class in order to unite the whole class that made the success (of the Cuban anarchists and IWW) possible,” not “a revision of anarchism to accommodate nationalism”. It is falsely claimed by some that Anarchism as currently constituted is unable to attract Black people, and other specially oppressed minorities. It is therefore argued that we should thus endorse separate Black-only anarchist/ community organisations that may in some (vague and unspecified) cases associate with “white” groups – “white” groups should “work among” “their own” people etc.). It is also asserted from this view point that Anarchism is “Eurocentric” and lacking an analysis of racism and imperialism. These arguments are wrong or lacking in clarity. They reflect a distortion of Anarchist history, and a misunderstanding of Anarchist strategy. Firstly, class struggle anarchism has historically proved quite capable of attracting massive numbers of people of colour. In fact, one could claim that historically most anarchist movements have been based in Third World countries. For example, anarchism dominated the revolutionary movement in China in the 1910s and early 1920s. In the First World, Anarchist movements historically attracted specially oppressed national minorities, for example, the syndicalist IWW attracted thousands of Black workers in the USA Deep South, and other movements, Jews in eastern Europe. Today, there are groups such as the WSF in South Africa and the Awareness League of Nigeria. The key to this success was a consistent class struggle program that combated all manifestations of oppression. For example, the Cuban Anarchists mobilized both Afro-Cubans, creoles and Spaniards in massive integrated anarcho-syndicalist unions because they opposed racist practices like apprenticeship laws, because they supported the anti-colonial struggle against Spain and because they provided a class struggle answer to the questions facing all sections of the working class. It was not a “revision” of anarchism to accommodate nationalist paradigms that made the breakthrough – it was the ability of anarchism to provide alternatives and to pay special attention to the specific needs of these different sections of the working class in order to unite the whole class that made the success possible. Anarchists did not capitulate to nationalist ideas – they combated them – they did not organise separately, they organised as Anarchists on a class struggle basis. Similarly, they were key players in anti-imperialist struggles in many countries, for example, Cuba (1890s), Macedonia (1880s), Herzegovina (1900s), Nicaragua (1920s), Ukraine (1918-21), Ireland (1916) and Korea (1920-40s). Again, class politics was the basis of this engagement. Even today, the Anarchist groups emerging in Third World countries like Nigeria and South Africa base themselves on a class program – we have seen the end results of nationalism and we oppose it (although obviously we defend people’s right to choose to believe in it, and even if we recognize grassroots nationalists as progressive fighters against racism etc.). This does not mean that we downplay imperialism or racism – on the contrary we pay specific attention to these key questions, but we subject them to class analysis and advocate class struggle strategies against them. This clearly shows that the claim that Anarchism is “white” or “Eurocentric” is fundamentally wrong, as Anarchism – in terms of its analysis, history and composition – has in all respects been a truly global movement against oppression in all guises. All modern Anarchists need to live up to this legacy. Black nationalism and/or separatism is not the only thing that can fight racism or attract Black people and workers to organisations. Even in South Africa, the Communist Party was the main mass organisation throughout the 1930s and 1940s and dwarfed the nationalist groups like the ANC; in the 1920s the main mass organisation (aside from the Communist Party) was the quasi-syndicalist Industrial and Commercial Workers Union. In Harlem in the USA in the 1930s, the CPUSA was able to win Black workers away from Garveyism on the basis of a consistent defence of the unity of White and Black workers. As Anarchists we call for separate organisation in one sense: we call on the working and poor people to organise separately from their class enemy, the bosses and rulers. What then of non-class based forms of separate organisation such as women-only organisation (as advocated by radical feminism) or Black-only organisation (as advocated by Black nationalists)? Before dealing with this issue, we need to understand the links between racism, class and class struggle. We would argue that racism is the product of capitalism and the State, created to justify slavery and colonialism in the Third World, and to divide workers, and super-exploit national minorities in the First World. Capitalism and the State are inherently racist: they always generate new forms of racism (e.g. against immigrants). The social inequalities created by racism can only be dealt with by the removal of capitalism and the State to allow for projects of redress, reconstruction etc. Therefore the fight against racism is a fight against capitalism and the State. Only the working class, poor and peasants can make the anti-state, anti-capitalist revolution because only these classes are productive (and can therefore create a non-exploitative society), and have no vested interest in the current system. In addition, as the vast majority of the world’s population we have the numbers to win, as well as the necessary social power (by virtue of our role in the workplace as producers of wealth we can hit the bosses and rulers where it really hurts – in the pocket) and organisational ability (our concentration in factories etc. facilitates mass action). The Black middle class, capitalists etc. will defend capitalism and the State against the workers despite the fact that this means they are defending the system that creates racism. It is in their class interest to do so. In any case, they are shielded from the worst effects of racism by their nice houses, good schools etc. Therefore the fight against racism requires a class struggle and a workers revolution. The struggle against capitalism can only succeed if it is anti-racist. We can only mobilize the whole working class if we fight on all fronts, against all oppressions that affect us. We can only unite the working and poor people for a revolutionary victory through a consistent opposition to the divisions within the working class and poor i.e. race, nation etc. Insofar as workers can only be mobilized and united on the basis of programs that oppose all oppression, insofar as working class Blacks are the most affected by racism and insofar as the majority of people affected by racism are working class, it follows that anti-racism etc. is a working class concern and issue. Therefore the fight against capitalism and the state requires a fight against racism. Given that the working class is multi-national and multi-racial, it follows that its struggle must be fought on internationalist, united, integrated lines. As argued above, this unity is only possible on a principled basis of opposition to all oppression. Are White Workers a ‘Labour Aristocracy’? No sections of the working class gain in real terms from the special oppression of Blacks, colonial people etc. In the First World, White workers may have slightly less unemployment etc., but they are still the majority of the workers and the poor i.e. of the exploited classes victimized by capitalism and the State. Racism worsens conditions for all workers because it divides workers struggles and resistance and ability to destroy the system. That is why the ruling class promotes it: it would never promote something that benefited the majority of workers. Therefore it is in these workers’ direct interest to fight racism and unite with Black workers. Even if these workers accept racism, they are still not its primary cause: racist-capitalism is. Nor are they its beneficiaries. At the same time, doubly oppressed groups like Blacks etc. require allies amongst the White working class. Without them, they lack the numbers, strategic position, or social power to defeat the racist system and its causes for once and for all. Unity is also in their interests. Similarly, the argument that the Western working class benefits materially from imperialism, is false. There is not a shred of proof, nor a sustainable economic theory to show this. Nor can any correlation be shown between the level of imperialist activity and the living standards of First World workers. On the contrary, imperialism is against the interests of these workers, because it strengthens the power of their own states (e.g. colonial armies are used against workers “at home” – remember Spain 1936? ), wastes resources and lives that could be spent on people on the military, promotes reactionary ideas like racism and imperialist patriotism that divide workers and strengthen the ruling class, and allows multi-national companies to cut jobs and wages by shifting to repressive Third World colonial and semi-colonial regimes. As Anarchists, we should unconditionally defend the rights of specially oppressed sections of the working class to organise separately because we defend the principle of free association. BUT we should separate the question of the right to organise separately from the issues of the usefulness of this mode of organisation. We simply cannot take it for granted that separate organisations are necessarily progressive or travelling the same road as we are. Separate organisations are not necessarily progressive – in some cases they are clearly reactionary and a step backward, in others they are poor strategy. Non-class based separate organisations typically fail to correctly identify the source of the special oppression faced by the group in question. For example, separatist Black nationalism calls for people of African descent to organise separately on the basis that all Whites are the source of Black oppression. Therefore they are the enemy. What such an approach fails to recognize is the primary role of capitalism and the State in causing Black oppression, and the common interests of both working class Blacks and Whites in fighting racism on a class-struggle basis (see above). Or it may be argued that capitalism is a form of racism – this again fails to recognize the common interest of both working class Whites and Blacks in fighting capitalism. Separate organisation that is not on a class struggle basis almost always lays the basis for cross-class alliances as is based on non-class identities and supposed common interests between all who share that identity. As we argue, only class struggle can end special oppressions such as racism and sexism. They thus became hitched to the class projects of capitalists, bosses and power-hungry would-be rulers. A case in point is the Nation of Islam in the US. Separate organisations can divide the working class into competing and fragmented sections. Why stop at separate organisation for women, Blacks etc.? The whole notion of separate organisation lays the basis for a continual fragmentation of identities and issues: gay versus black versus women versus lesbians versus bisexuals versus gay blacks versus white blacks versus bisexual males etc. Instead of an emphasis on difference, what is needed is a search for points of agreement and common interest: divided we are weak – it is class that provides a basis for uniting the vast majority of the world’s population against the primary causes of poverty and oppression: capitalism / the State / the ruling class. Some call for separate organisation on the basis that only separate organisation can prevent the marginalisation of the concerns of a particular group. For example, Black nationalists in the US often call for Blacks to organise separately so that they are not, for example, marginalised or ignored in mainly White organisations. While this is an important issue, it does not follow that separate organisation is the best solution. Not at all! Separate organisation often reinforces the marginalisation of a group’s concerns, for example, it can be used as a way of ghettoising issues. Rather than challenging racism, such organisations allow racism to be ignored by others. White workers can ignore the issue: “leave it to the Blacks, it’s their concern, not ours”. But should, say, illegal immigrants have to fight against racist immigration laws on their own, or should they have allies from other sections of the working class? “Self- determining” isolation can readily lay the basis for weak struggles that are easily defeated by the ruling class (see above). Finally, the claim that Blacks can never function in integrated organisations expresses a disturbing lack of confidence in Black people’s abilities. Instead, we should win all sections of the working class over to a program of opposing, not ignoring, all oppression. This is a more effective way of winning demands. Even if some do not have direct experience of a given oppression, it does not follow that they are unable to be won to a position of opposing it. As argued earlier, no workers really benefit from special oppressions like racism. It is in their interest to be anti-racist. Separate organisation is not even progressive in some cases. Separate organisation in the workplace is NOT acceptable in any case where industrial unions of all workers exist. The logic of trade-union organisation is to unify different categories of workers, who can only find strength in their unity. To set up a separate Black trade union in a situation where Blacks are a minority weakens the existing unions, but puts these workers themselves in a weak and unsustainable position due to their limited numbers, as well as in direct conflict with the existing union, thus creating a dynamic that can lead to the destruction of union organisation in the plant as a whole. Maximum unity on a principled basis is always desirable, supported and fought for. Black-only unions are a recipe for failure where Black people form a minority in the working class (obviously the situation is different in South Africa where the Black working class is the majority – but more on this later). How can one even launch mild forms of industrial action without the support of most workers? Furthermore, separate organisation is only admissible in cases where workers face a special oppression. We do not support Zulu-only unions like UWUSA (in South Africa) because Zulus do not face a special oppression as Zulus. Separate organisation is not innately progressive. It can be used as a tactic to roll-back worker struggles and undermine the left. For example, the nationalist-minded liberal middle-class Black leaders of the mass Industrial and Commercial Workers Union in SA in the 1920s used arguments that the Communist Party was a “White” institution to expel socialists from their ranks and hand the union over to (White!!) liberals like Ballinger who opposed anything other than simple bread and butter, non-political orthodox trade unionism, as opposed to the ICU’s previously semi-syndicalist positions. Having said this, it is clear that Anarchist political organisations should be integrated. Having said this, we do recognize that it may be necessary to set up commissions/task groups within these organisations to focus on specific issues e.g. groups to work on immigrant support. These are not separate organisations, but working groups integrated into the overall organisation, and to which any member may belong. People respond to capitalism and the State in a variety of ways, and through a variety of ideologies. How should we relate to these groups? In general, the WSF apply the following “rule of thumb”. A basic distinction can be drawn between “political groups” (those which unite people on the basis of accepting a certain ideology – such as political parties), and “economic groups” (those which unite people on the basis of their common, immediate social and economic interests – such as unions, rent-strike committees). We would work alongside in “political groups”, for example, around campaigns. class consciousness and workers power: these groups should be run by the working class and reject class collaboration. provide a united basis for self-management after the revolution. In South Africa, this situation is somewhat different. Clearly, the defeat of racism in South Africa does also require a class struggle and a workers revolution (as elsewhere). But here the Black working class is the majority of the population, the most radical, combative and organised force in society. Thus the question of Black workers presents itself in a different fashion here as it is obvious that the Black working class will be the force that makes the SA revolution. Since there is no left-wing or working class movement that can possibly marginalise the Black working class, the need for special committees, sections etc. to deal with racism is redundant in the South African case. What then of White/Black worker unity? This unity was remote in the extreme in the apartheid years – it was extremely unusual for White workers to join the struggle of the Black working class under apartheid, precisely because of their extreme level of privilege (although some did, mainly from the Communist Party). So, in contrast to the situation in the West, White workers here actually did benefit from racism. Nonetheless, inter-racial workers unity (on an anti-racist platform) would have been advantageous even under apartheid because it would have weakened the armed power of the State (most Whites were at some or other point soldiers and were and are workers). With the demise of formal apartheid and the move to a formally non-racial bourgeois parliament, the prospects for such unity are far better. The economic crisis, the removal of job reservation and other legal privileges, the breakdown of the alliance between Whites of different classes that underpinned the racist regime all make a workers alliance and unity more feasible. Thus we have a situation where literally tens of thousands of White workers and historically White unions have actually joined the non-racial integrated COSATU unions; the main historically white union federation, FEDSAL, has also begun co-operating with COSATU in negotiations and even demos (although White worker attendance is quite poor). We should support this unity, so long as it is on an anti-racist basis, and so long as the general layers of activists remain broadly representative of the mainly Black unions. In other words, workers unity is good, if only in terms of our proletarian internationalism and non-racialism, but the basis of that unity must still be the struggle against racism as well as capitalism. In any case, it is clear that the Black working class will still be the battering ram that destroys the system (the possible participation of White workers as reliable allies notwithstanding). Therefore, class unity on a principled anti-racist basis (with the provisions for special organisations outlined above) is the key to freedom.